A tree fell onto these vehicles in my neighborhood during storms Thursday evening. TORNADOES TERRIFY ME. So when severe weather, with the possibility of tornadoes, was forecast for southern Minnesota Thursday afternoon into evening, I felt a bit on edge. Not overly worried. But with the underlying thought that storms could happen here. On the side street by my home, crews strategize the day after the storm. Multiple confirmed tornadoes touched down in southern Minnesota Thursday evening, including one near Faribault. My community of some 24,000 was also hard hit by strong winds of up to 110 mph which destroyed the airport and ravaged my Willow Street/Tower Place/First Avenue Southwest neighborhood and many other neighborhoods. The front page of the Faribault Daily News, September 22, 2018. Two Faribault men are recovering from injuries sustained when a tree fell on them during the storm, according to a report in the Faribault Daily News. In nearby small towns, it’s a similar story with downed trees and power lines and damage to vehicles and homes. In Morristown, though, homes were leveled and others uninhabitable. From Granada to Cannon Falls, tornadoes and severe thunderstorms swept a swath of destruction across the landscape—demolishing farm buildings, flattening crops, downing too many trees and power lines to count. Those stories I’ve read online and in print. The stories I’m sharing today are mine from observations and conversations. These are the stories that touched my heart, that even made me cry. But first, I’ll start with the sirens sounding and then, the storm. My next-door neighbor’s flag was ripped from the pole, landing in the top of an evergreen. It’s around 6:15 p.m. Thursday and I’ve just finished the dinner dishes. Randy is deciding whether to replace the radiator in our car or head to the basement to work on a stained glass window project for our church. He chooses the window. He has just stepped into the shower when emergency warning sirens begin blasting. I look outside to a sky that seems anything but threatening. I switch on the TV. A tornado warning for Rice County and many other Minnesota counties scrolls across the bottom of the screen. I turn on the radio. The announcer warns listeners to seek shelter immediately with precise times the storms are expected to hit each community. Target time in Faribault is 10 minutes. I storm into the bathroom. As is typical with Randy, he shows little hurry, little concern, about the storm warning. I already feel my anxiety rising. He did not witness the aftermath of a killer tornado that claimed nine lives and injured 125 in Tracy, Minnesota, in June 1968. I did. A tornado also hit my family farm and my hometown years after that. I grew up with a respect for tornadoes. I hope I can convince him this is serious. As Randy showers, I close windows, gather flashlights, scoop up my camera bag and external hard drive. Within that 10-minute time frame we are in the basement with our cellphones, the radio tuned to the local station, airing its usual 6:30 p.m. reciting of the Rosary. I want local up-to-date weather news. This image shows the conduit and power line ripped from our house, the wire lying across the driveway. Randy backed the van across the neighbor’s lawn to get out. It doesn’t matter. Not long after, a loud bang sounds and the power goes out. Randy continues cutting stained glass while I worry and text our daughter traveling in California. We hear and see little in our basement with two glass block windows. It’s probably better that way. But when I hear a roar, I ask whether that is rolling thunder or the signature tornado sound of a train. Randy says thunder, but not with significant confidence. Sirens continue to wail off and on for nearly 40 minutes. I’ve never heard emergency warning sirens blare that often for that long. Ever. I understand this is serious. To say I am terrified would be accurate. I continue to text family who are keeping us updated from media accounts. We are trying to conserve our cellphone batteries with no way to charge them. Around 7:10 p.m., we emerge from the basement to survey the damage. Energy crews are working long shifts, up to 16 hours one worker said, to restore power in Faribault and neighboring towns. We were without electricity for 26 hours. Power could be out for 4 – 5 days for some people. We are fortunate. In the last remnants of daylight, we see that the power line and meter are ripped from our house, the line slicing diagonally across our driveway behind the van. Everywhere, across our arterial street and up side streets, trees block roadways. It’s a mess. As rain falls, we walk a half-block in the dark, my concern mounting that we could encounter fallen power lines. I don’t feel safe. Traffic is metro rush hour heavy and I wonder why the heck all these people are out and about. A man directs traffic around a fallen tree blocking a lane of Willow Street. There is nothing we can do. Damage assessment will come at daybreak. Across the street along Willow Street early Friday morning. We are up early after a restless night of little sleep. In the light of morning, we see trees down everywhere in our neighborhood. Passing by the remnants of a fallen tree, Randy points to three squirrels clinging to the trunk. They are shaking. A half block from my home trees fell onto two vehicles along First Avenue Southwest. Up the hill, just a half-block away, a tree lies across a car and a van in a driveway. We chat with the homeowner, who says both can be replaced. Life can’t. It’s a theme we hear repeated. Across from our house along Willow Street. Crews line Tower Place, the side street by my house, as they work all day Friday and also into Saturday. A downed tree blocks First Avenue Southwest a short distance from our house at its intersection with Tower Place. A young man pauses to talk to us. He’s checking on his brother. At one point during our conversation, I mention that we are conserving our cellphone power. He continues up the hill. Within 10 minutes, he approaches us as we chat with an elderly neighbor. “Here, I want you to have this,” Xavion says and hands me a cellphone charger. “God bless you.” I am crying at the kindness of this young father. He asks to pray with us. So there we are, the morning after the storm, standing in our neighbor’s front yard, the four of us circled, hands joined, Xavion praying. It will not be the first time of circled prayer. This marks a profoundly powerful moment for me, this giving of thanks by a kind stranger in the aftermath of the storm. Three trees fell at my friend Lisa’s house, one against her house. This tree will be removed by professionals. Two others were removed by a friend and a crew of workers including Randy and me. I expect many in my community could share similar stories of kindness. At Basilleos Pizza on Friday evening, Manager Connie tells us how, earlier in the day, staff baked 30 pizzas and then gave them to random people working on storm clean-up. Saturday morning my friend Lisa’a neighbor drops off bottled water for the crew of 16 assisting with tree clean-up. Several others also bring water and another friend drops off scalloped potatoes, grapes and homemade cookies. A city worker carries a chainsaw to clear a tree from a street in my neighborhood late Friday afternoon. City crews clear away a tree blocking First Avenue Southwest. The buzz of chainsaws is nearly constant throughout Faribault. City crews continue tree clean-up. An email went out the afternoon prior to show up at 9 a.m. at Lisa’s house. Three teens arrive with their dad and grandparents. A couple who live nearby also come; they’d stopped by on Friday with Klondike bars after losing power. Hours later when we’ve finished clean-up, we gather in a circle, all of us holding hands, the nearby neighbor—a pastor I would learn afterward—leading us in prayer. Still working along Tower Place. A shot through my dining room window of Xcel Energy crew members working on lines to reconnect to our house. At the end of our driveway, workers prepare to string new power lines. We have much to be thankful for. Each other. Protection. A beautiful Saturday of sunshine. Caring neighbors and co-workers and friends and strangers and professionals. It is said that difficult times bring out the best in people. I witnessed that firsthand in Faribault in the aftermath of this storm. FYI: You won’t see photos of damage outside my neighborhood (except at my friend’s house) as local officials advise gawkers to stay out of storm-damaged areas. IN THE NAKEDNESS of winter, when trees are stripped bare of leaves, when fields lie exposed to the elements, rural Minnesota seems especially vulnerable. Near Essig along US Highway 14. In no other season do I notice more the intimate details of this place. Along US Highway 14 somewhere west of Owatonna. Power poles appear more intrusive. Grain elevators dominate, shoving grey mass into an already colorless landscape. All of this I see through eyes that crave now the melting of snow, the cloaking of the land in the greening of spring. NOTE: All images have been edited to create an artsy look. Looking to the north and the Minnesota River Valley just outside Delhi around 4 p.m. Monday. TO THE NORTH, storm clouds bruised the sky late Labor Day afternoon. To the east of Delhi heading toward Redwood Falls. Brooding blue, then masses of grey before the rain gushed near New Ulm as we drove east from the southwestern Minnesota prairie toward home. The rainfall, while heavy at times, seemed nothing more than a September downpour. Sky and corn define this area of Minnesota. Well before we got to Mankato, the rain stopped. The farther east we drove, the more ominous the clouds appeared. Yet clouds continued to stack and I began to consider the possibility of severe weather as we entered Waseca, then Steele, counties. Randy switched on the radio to a local station but then turned it off when our son called from Boston. 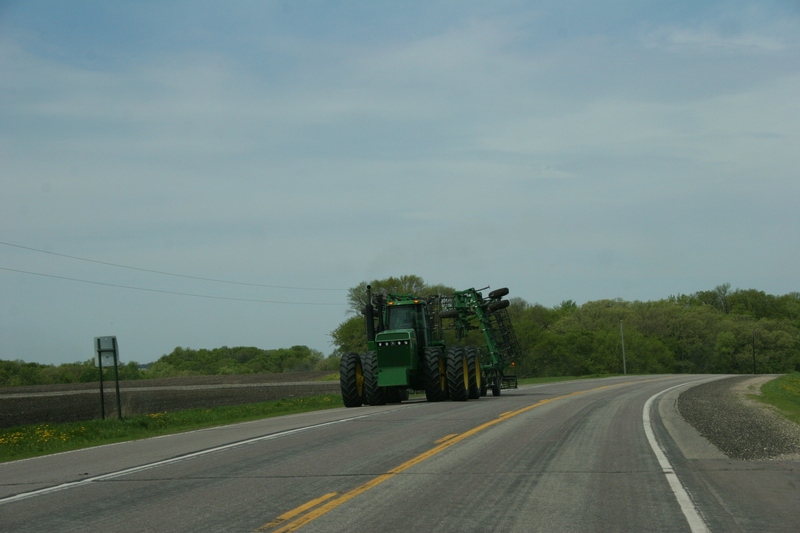 I ended the conversation as we reached Owatonna and exited U.S. Highway 14 onto Interstate 35. Rounding the entrance ramp, Randy noticed a state highway patrol car and, then, a short distance later, another. By that time the rain had ramped. Wheels hydroplaned. And the wind blew so fierce the van rocked. “I’m scared,” I said. “I want to get off the interstate.” Randy steered the van off the next exit, much to my relief. But I was still scared. I don’t like storms or strong winds like these of probably 50 mph. I’ve seen the damaging power of tornadoes and straight line winds and I respect them enough to fear them. 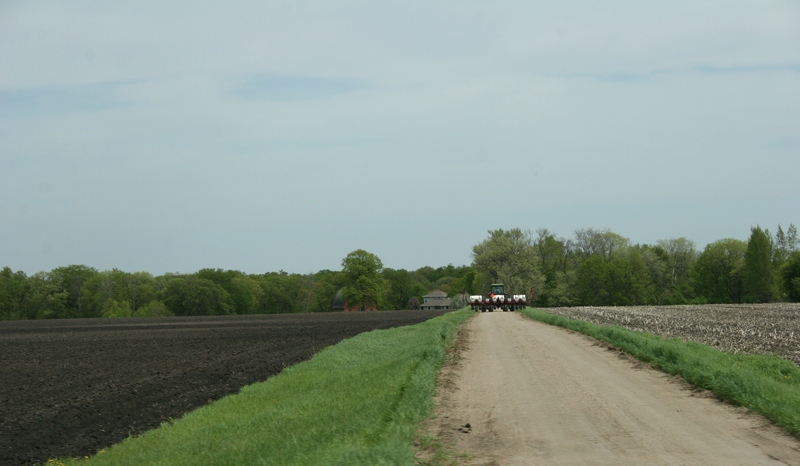 Just a few miles from Faribault on Rice County Road 45. We drove through part of Owatonna, the wind still whipping trees. The short detour off I-35 proved enough to semi calm me before Randy directed the van out of town along a back county road. I wanted nothing more than to get home to Faribault. I’d had enough of the wind and the rain on an otherwise glorious September day in southern Minnesota. TELL ME: Have you ever been caught on the roadway in a storm that scared you? I’d like to hear about your experiences. If you were to read the biography of country and oldies rock n’ roll singer Dunnell Lenort, it would read like a country song. Heartache and hardship. Good times and bad. But through it all, he perseveres. I knew none of this when, in July 2012, I listened to Dunnell perform “I Fought the Law” at the 26th annual Steele County Historical Society Extravaganza at the Village of Yesteryear in Owatonna. It was an afternoon of living history, activities and entertainment. I often wonder what brings a singer onstage to perform with a passion. So when I chose Dunnell’s image for today’s portrait feature, I googled his name to learn more. After hearing Johnny Cash on a home stereo at age five, Dunnell knew he wanted to sing. But his journey into music starts even earlier. A stroke at only eight months old paralyzed Dunnell’s right leg and arm, beginning 20 plus years of trips to Gillette Children’s Hospital for treatment and multiple surgeries. Through it all, one thing kept this young man’s spirits high—music. His music career has ebbed and flowed. He once performed on the stage of the Grand Ole Opry and as an opening act for Roy Clark at the Surf Ballroom. (Buddy Holly performed his last show there before the February 3, 1959, fatal plane crash near this Clear Lake, Iowa, venue.) Mostly Dunnell has entertained audiences in southern Minnesota and northern Iowa. County fairs, casinos, community events. He lives in Twin Lakes, a small town in Freeborn County. In early 2008, Dunnell’s beloved wife, Angie, underwent surgery to remove a cancerous brain tumor. Things were going good until the couple was seriously injured in an automobile accident several months later. Angie lost her battle with cancer on September 24, 2014. Now that’s a country love song if ever I read one. 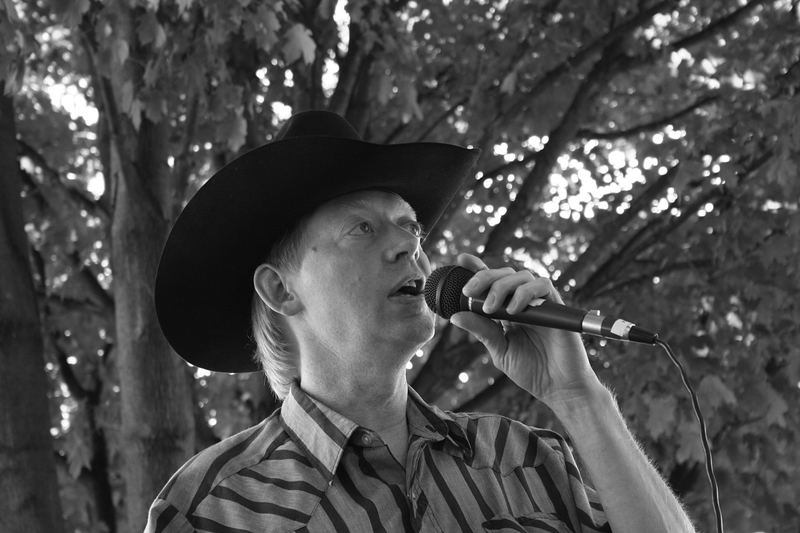 Dunnell has many performances booked already for this year, including an appearance again at the July 12 Steele County Historical Society Extravaganza. He’ll take the stage at the Village of Yesterday at 1 p.m. If you happen to hear Dunnell perform anywhere, remember his inspirational story. His is a story of strength and love, holding strong to hope and a dream. This is part of a series, Minnesota Faces, featured every Friday on Minnesota Prairie Roots. WHAT DO YOU LOVE about Southern Minnesota? Now Southern Minn Scene, a regional arts publication/entertainment guide, is once again opening up nominations for the best restaurants, bars, music, theater, art, sports/outdoors, retail/services and miscellaneous offerings in our area of the state for 2014.
Who has the best fish fry or catering or BBQ in Southern Minnesota? Where can you find the best Bloody Marys or happy hour? Which music festival is a must-attend? Who’s the best visual artist? What would you rate as the best campground, sledding hill (yeah, I know, who wants to think winter) or bait/tackle shop? What’s your go-to antique store? And, finally, in the miscellaneous category, you can nominate “best ofs” like the best farmer’s market, best place to watch people and best blog/blogger (ahem, maybe Minnesota Prairie Roots). From now through July 27, you can submit your choices. The top three to five nominees in each category will then be announced as finalists around August 1. Thereafter you will have until Labor Day to vote for the winner. Simple and fun. And a great way to honor all the great people and places and things of Southern Minnesota. Click here to begin the process of nominating your favorites in Southern Minnesota. 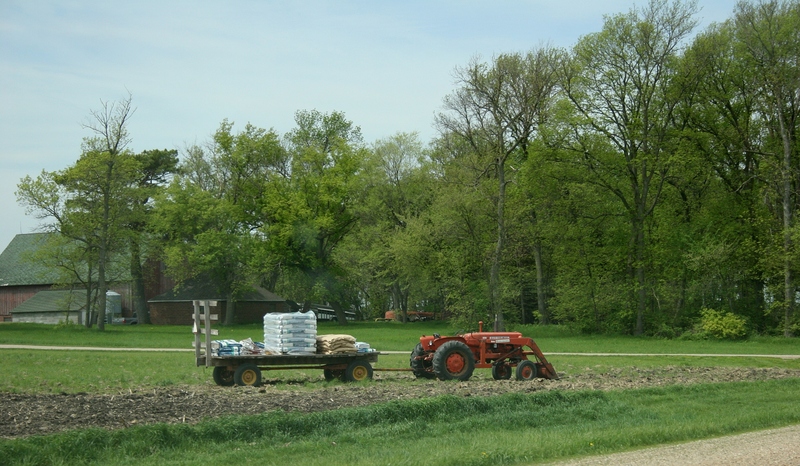 IF THEY WEREN’T WORKING the land, farmers along a stretch between Mankato and west of New Ulm were preparing to plant on Saturday. 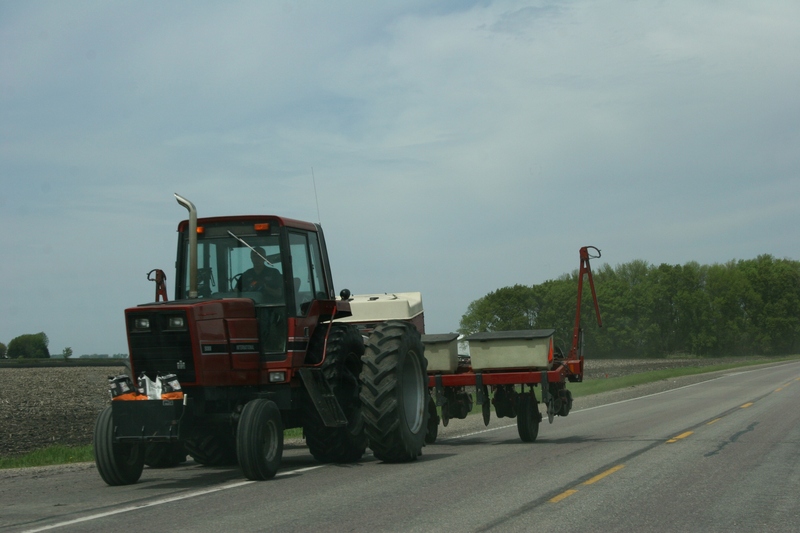 Everywhere, these tenders of the earth steered tractors along roadways and through fields, hurrying to prep the soil and seed crops during this year’s delayed planting season. 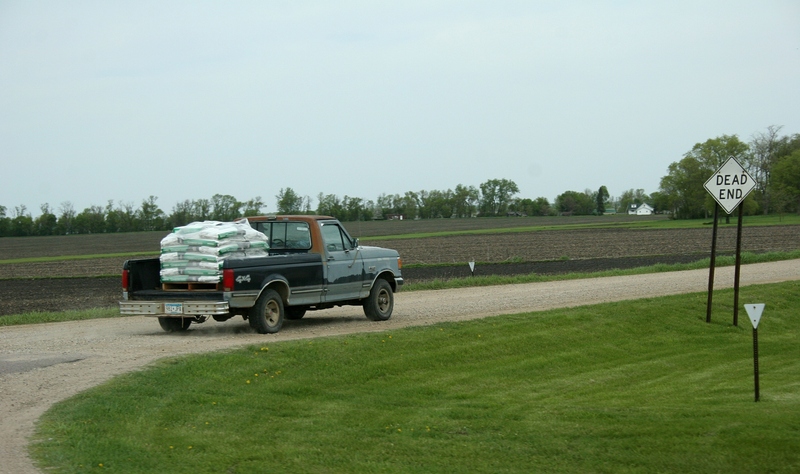 Seed bags topped wagons and pick-up trucks. Mammoth tractors pulling equally mammoth implements crept along rural roadways. Sky and land swallowed small scale tractors. On a rare occasion dust flew in the field. And I took it all in, savoring this sweet time in the growing cycle as only one born and raised on a farm can. This place, this land, still claims my heart each spring, each summer, each fall, through the seasons of planting and growing and harvest. Photos were taken along U.S. Highway 14 and along Brown County Road 29.